Many injuries occurred at the end of the demo between the villages of Bure and Saudron. When protesters decided to confront police one last time, the cops riposted with all the so-called ‘non-lethal’ weapons available to them. They later attacked medics causing panic and further wounds. Robin, a 27 year-old father, told France 3 that he may have to be amputated of several toes and lose the use of his left foot. He also denounced the disproportionate use of force saying that police clearly aimed at killing and wounding. Robin more specifically pointed to the use of GLI F4 stun grenades. He was aggressively questioned by cops on his hospital bed for almost two hours. GLI F4 grenades are equipped with TNT explosives and burn clothes and shoes when falling back on the ground. Paris-Luttes website reports previous instances of police wounding protesters with this weapon. In 2001 at a firefighter demonstration in Lille, Edouard Walczak lost a hand when he picked up one GLI F4, mistaking it for a classic teargas grenade. Vmc.camp webpage counted and detailed all the grenades and other projectiles used in Bure (pictured above). In Bure, the strategy of authorities seem to have shifted from protection of the nuclear site with limited clashes with protesters to a brutal repression including daily intimidations and confrontation. 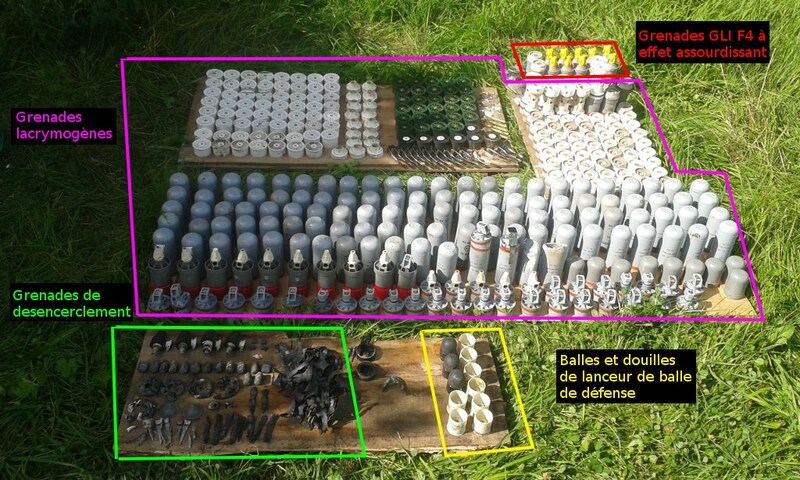 The use of GLI F4 grenades was almost forbidden after the death of Remi Fraisse, an environmentalist who past away when he was shot in the back with a similar grenade at the ZAD du Testet in October 2014. At the time, French authorities argued that such weapons were necessary to keep protesters at a distance during riots, a tactic often used by riot police in France who is known to make excessive use of teargas and LBD, or similar rubber bullet guns. In Bure, the strategy of authorities seem to have shifted from protection of the nuclear site with limited clashes with protesters to a brutal repression including daily intimidations and confrontation.